Culinary students may still squeeze themselves into the stiff white chefs coat, long the industry’s de rigueur uniform. 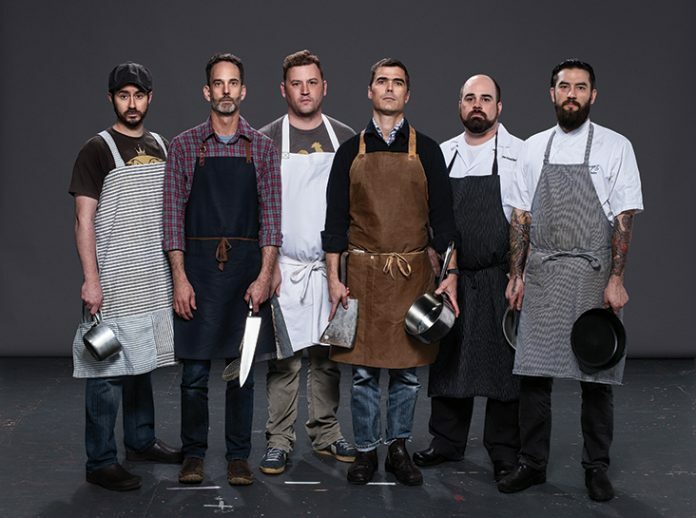 But the new must-have garb, particularly among Atlanta’s male chefs who have made it to the top of the food chain, is the designer apron. Fashionable and functional, the next-gen cooks apron takes its style cues from protective gear worn by hunters, gardeners, butchers, and carpenters. And it’s a far better choice for making a statement than a silly towering toque. Local clothing designer Shannon Johnson made this apron using scraps of vintage ticking, copying a traditional Japanese pattern with broad straps that cross in the back. Satterfield’s favorite apron is a lightweight waxed cotton design called Contra, a limited-edition piece from Tilit Chef Goods out of Brooklyn. Brown—who opens Lusca with partner Nhan Le this spring—is working with a local seamstress on his own apron line. Note the X on the right shoulder, Brown’s signature touch. When not wearing a mustard-colored shop apron made by OMFGCO Bridge & Burn, Acheson sports this oilcloth apron—a gift from Southern fashion maven Billy Reid. A classicist, Ginsberg wears a long, bib-style apron made by chef apparel company Bragard USA. He keeps a neat stack of them in his car’s backseat. Schafer and his crew wear heavy-duty cotton Cayson-brand aprons, double-lined in the front to help deflect the heat from the restaurant’s ferocious wood-fire grill.